About two and a half years ago I was invited to a close friends wedding. The invitation was gorgeous in its simple elegance. It took me a moment to realise the reason it looked so simple, neat and clean was that there wasn’t all of the usual information cluttering the space. My eye fell on a note at the bottom of the invite which directed guests to a website for more detail. Clever. Logging onto the website I wasn’t sure what to expect, but when I got there I was in awe and completely impressed. In fact, it pulled at my usual ‘wedding-envy’ feelings that I try to keep squashed … the ones where I wish I got to plan my wedding all over again because it was so much fun the first time around! The reason this website was so perfect was that it was both practical and emotional. There was information pertaining to the wedding but also stories and anecdotes, which aroused the overall feelings of a couple madly in love. As the website loaded, a romantic song started to play. The homepage was full of pictures of the lovebirds, and the story of how they met captured your attention. Reading the story firsthand, in their words, made me feel closer to the couple and in a way also made me feel more involved in the wedding than if I had only received a paper invitation. Further pages presented us with maps for the church and the reception, accommodation options with prices and lastly an itinerary. As it was an ‘away’ wedding, the itinerary for guests was jam-packed for most of the weekend. There was golf, BBQ’s and a brunch for the day after the wedding. But instead of making you feel like you were obliged to attend all activities there was a simple RSVP button for each separate one so you could choose what you wanted to attend. 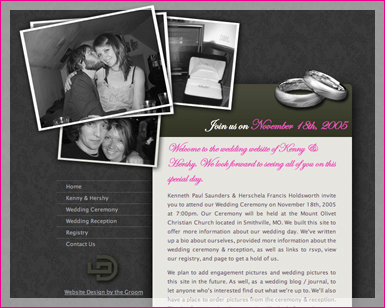 This couple were lucky enough to be great friends with a web designer, so their website had all of the bells and whistles mentioned above. If you like the idea of this but don’t have the money in your budget for a web designer, you can try creating a website yourself. So if you are looking for a way to get some of the clutter off your beautiful invitation, or even if you are looking for a way to eliminate the need for a paper invitation altogether, look into creating a website specially for the big day!